Focused on technological up-gradation, dynamism and innovation, we are moving ahead by maintaining timeliness in delivering a wide gamut of Jumbo Jaali Crate. The offered crate is manufactured and designed under the visionary guidance of skilled professionals using supreme quality plastic and ultra-modern machines in adherence to set industry norms. 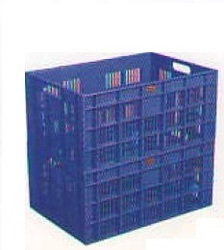 It is widely used for storing products in bulk. We offer this crate to our clients at affordable rate. Established in the year 1996, at Mumbai (Maharashtra, India), we, “Rita International”, are reckoned as the renowned manufacturer, exporter and supplier of a highly durable assortment of Full Pack Crates, Side Jaali Bottom Pack Crates, Full Jaali Crates, Banana Crates, Jumbo Crates, Dairy Crates, Fabricated Crates, Catering Crates, Container Crates & Boxes, etc. Our complete product array is manufactured under the supervision of experienced professionals using the best grade basic material and latest production machinery as per the international parameters. These products are highly acclaimed for their attractive designs, smooth surface finish, dimensional accuracy, sturdy construction and durable finish standards.